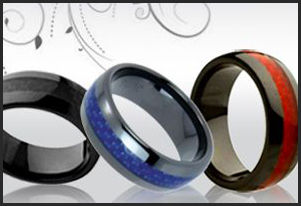 Our large selection of beautiful Cobalt Chrome rings wedding bands are sure to instill integrity into your marriage. 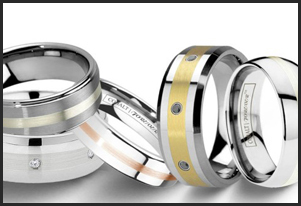 Cobalt Chrome wedding bands are the whitest contemporary rings on the market. Much whiter than tungsten and almost as tough. When looked at side by side as platinum the naked eye can hardly tell the difference .Lifetime warranty, lifetime sizing, and guaranteed for life! Our large selection of beautiful Ceramic rings wedding bands are sure to instill integrity into your marriage.Ceramic wedding bands are much stronger than the name sounds. They are in fact more scratch resistant than tungsten and much more lightweight. Made from the same metal as synthetic diamonds. Lifetime warranty, lifetime sizing, and guaranteed for life! 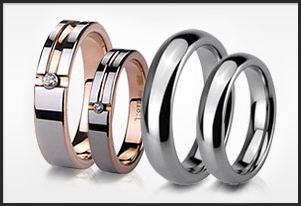 Our large selection of beautiful Titanium rings wedding bands are sure to instill integrity into your marriage. 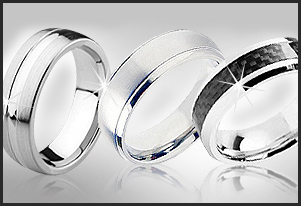 Titanium rings are known as the first contemporary wedding band. Lightweight and much stronger than precious metals. Aircraft grade rings. Lifetime warranty, lifetime sizing, and guaranteed for life!